Sorry, that ID is not registered yet. 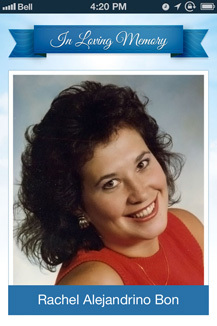 Visitors scan the MemoryLink to learn more about your loved one. Click this to see the menu navigation screen. Add the obituary of your loved one. Tell the story of your loved one in an unlimited biography. Upload as many videos as you like. Home movies are a great way to keep the memories alive. Add unlimited photos sharing the life of your loved one. Add links to obituaries, Facebook pages, charities, etc. Location information of the final resting place. How long does it take to receive the Memory Link after ordering? 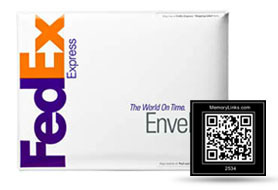 Your Memory Link will ship the next business day after your order is placed. You should receive it in 3-5 business days. How do I create the Permanent Online Memorial? Once you receive and register your Memory Link, you will create a username and password. You will then login and begin creating the memorial. How do I scan the Memory Link? Most smartphones come with a built in bar code reader. If your phone does not have one, there are a number of free apps that read bar codes. Simply point your smart phone at the link and the permanent memorial will be displayed. What type of monuments can the Memory Link be attached to? Memory Links can be attached to headstones, mausoleums, cremation niches, memorial benches, plaques or any other type of memorial. What information is included in the Permanent Online Memorial? The permanent memorial includes biography, family (geneaology) and photos and videos. You can add as much or as little information as you like. Is the Memory Link weatherproof? Yes. Memory Links are made from a special material that is weatherproof and has been fully tested to withstand the harshest elements. Is the Memory Link guaranteed? Yes. If for some reason your Memory Link is damaged or lost, we will replace it at no cost to you. We will even cover the shipping to you. 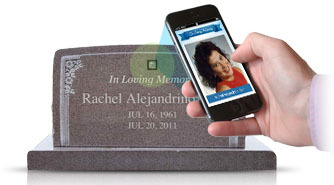 Would you like to offer the latest memorial technology at your cemetery or in your monument showroom?